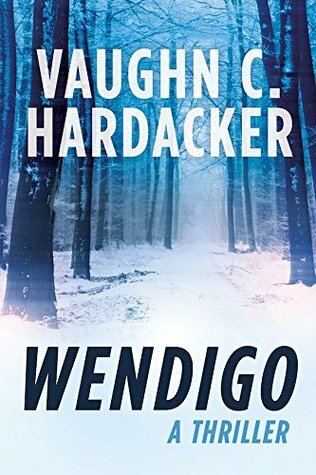 Book Lovers Life: Wendigo by Vaughn C. Hardacker Review! John Bear has heard the old tales of the Wendigo from his grandfather. He's never believed them but when a body turns up with it's insides torn out and the only tracks are that of a massive footprint, he knows that it can't be a human print. It isn't till another body turns up that he has no other choice but to believe that the Wendigo might just be real. I was excited to read this because the Wendigo is such an incredibly scary thing and I love to read books about them, and while this was a good read, it suffered a bit from the fact that there was a lot of telling and not enough showing! The plot was slow going, but it was also intriguing enough that I kept reading. I liked seeing how the Wendigo first came to be and enjoyed the hunt, I just found it a little too slow at parts and my attention started to wander. I wanted there to be more tenseness and excitement! Character wise, they were all well written and developed! The characters were the best part for me, they were varied and I liked them all. Jonh Bear was interesting and I loved how he tried to tell everyone what they were chasing despite them thinking he was crazy. In all, I did enjoy the read some what, though it could have been so much better!! If there is a book 2 with these characters, I might just have to check it out.